The Simpsons sit on the couch as normal. The wall turns around to reveal a mad scientist who has Ned Flanders chained to the wall. The scientist cackles maniacally as Ned whimpers and struggles against the chains. "I will not “let the dogs out”"
"Pokey Mom" is the tenth episode of season 12. It originally aired on January 14, 2001. The episode was written by Tom Martin and directed by Bob Anderson. Michael Keaton, Charles Napier, Bruce Vilanch and Robert Schimmel guest star. "Marge feels sympathy for an inmate she meets at a prison rodeo, vouches for him at his parole hearing and tries to assist his reentry into the real world. Meanwhile, Homer starts his own chiropractic office." After Marge forces the whole family to visit the Apron Expo (which, ironically, everyone enjoys except her), they decide to go to a prison rodeo. There Marge meets a prisoner named Jack Crowley, and believes he could be a great artist after witnessing some of his work. Marge decides to start an art class at the prison, then gets Jack out on parole under her custody. Jack needs a job, and she find there is a mural-painting job going at Springfield Elementary School. Jack paints a captivating mural, which everyone loves, apart from Principal Skinner - He thinks the image of a shapely female warrior riding a Puma doesn't have any place at the school. Taking his advice, Jack changes the picture into a childish and colorful image, and everyone hates it. Skinner once more admonishes him for making such a horrible painting, refusing to admit that any fault belongs to him. Jack goes mad, setting fire to the picture (revealing the first one underneath) and Skinner's car. 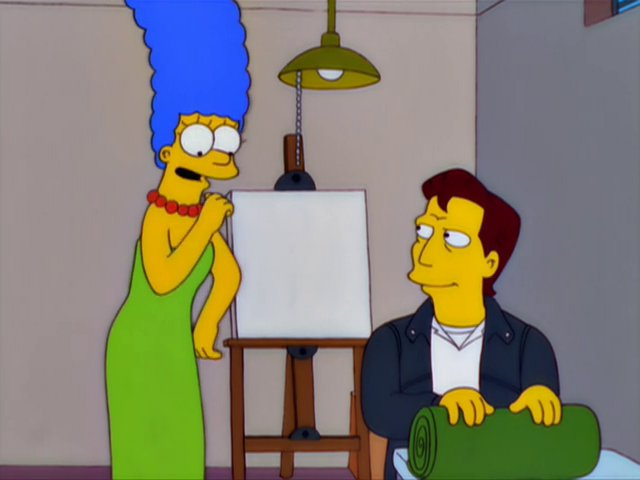 He lies to Marge, saying that he did not burn down the picture, but is soon found out and returned to jail, disappointing her. Meanwhile, Homer has been suffering from a back injury he picked up at the prison rodeo, and goes to see a Chiropractor. The chiropractor says he cannot fix his back, which may have something to do with Homer blatantly refusing to do the exercises to go with the therapy. Homer falls over a battered garbage can... and his back is cured. He realizes that its dents line up perfectly with the vertebrae of the human spine. He starts up his own business fixing people's backs, and names his creation "Dr. Homer's Miracle Spine-O-Cylinder". It becomes a huge success, but then other chiropractors (who are losing money from Homer's one session treatments) catch up with him, destroying his garbage can. Modified on March 28, 2019, at 13:26.